New Idea Society's full length is easily one of the most unique albums to be released in recent memory. Stephen Brodsky and Mike Law have composed original songs teeming with lo-fi rock, 60's pop, and hints of folk. So if you haven't bought into the hype yet, it's not too late to run out to your local record store for a copy. Scene Point Blank: First off, I want to start off saying that I really enjoy the new album; it's one of my favorites of the year so far. Besides the fact that the two of you are in other bands, was there any other major hold-ups in putting this record out? Stephen Brodsky: I'll let Mike take this one! Mike Law: Thanks, Glad that you like the record. I am excited how much is happening around it and the response we are getting. Our schedules were really the main thing that slowed the record. At the time Cave In was pretty much touring the entire world. Eulcid was also touring a lot and doing stuff with the Boston DIY community. This left very little time for us to work on the record. By the time we finished it the original label seemed to be in a money crunch. We toyed with the idea of doing it with some bigger indies, but they were too shady, so we went with someone we could trust in Magic Bullet. Scene Point Blank: Although the name itself is taken from a Giants Chair song, was the name meant to imply some sort of musical progressiveness, be it within your own realm of writing, or the whole music field? Mike: I honestly cannot remember quite why we took that name. Not to much thought was put into it really (which I kind of regret now). We had a few offers to release some of our songs so when one went on a sampler we just went with that name. I suppose it is kind of nice though as The Giants Chair was one of the first bands Stephen and I bonded over. Scene Point Blank: You have quite a few former and current projects and all of them seem to touch on very different styles. 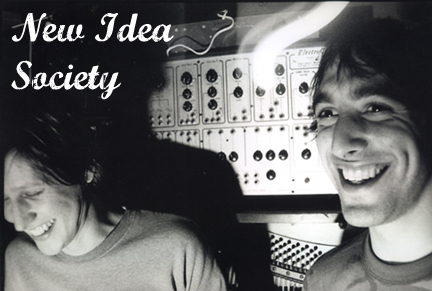 When did you start toying around with the idea of New Idea Society? What were you listening to at the time and what bands/artists have influenced you to keep on with it? Mike: Eulcid was something that consumed me conceptually and politically. NIS is something that would just happen. I would pick up a guitar and a song would already be there. I have always written songs of this type so it is natural something like this album would eventually see the light of day. I do not foresee a time when I will not write songs like this. They just happen. I only have to pay attention to how I am feeling. As far as the what I was listening to influencing the songs, I don't think that is particularly relevant. I think what I was listening to may have influenced the sounds more than the songs. I remember specifically thinking about The Beach Boys' "Smile" when we recorded the vocal harmonies for "Waiting For the Moment To Oblige", and George Harrison on some of the guitar solos. I like the sounds of those recordings. More than anything though I simply enjoy Stephen and I sitting around thinking about how we want to interpret the song. Stephen: Between the two of us is where the inspiration could be rooted. I really enjoy Mike's songwriting, and his tunes have helped me develop an appreciation for songwriters like Robert Smith, Frank Black, and Woody Guthrie... he'd always come around to referencing those people's work when it came time to actually collaborate on New Idea Society tunes. Scene Point Blank: I noticed that some of the vocal melodies on this record are very reminiscent to the ones found on Cave In's, Tides of Tomorrow. Were you in the process of writing this record at the same time as that or was that something that all of Cave In wanted to explore as well? Mike: I haven't noticed that. It is possible. Stephen: A bulk of the NIS album was in the works at around the same time "Tides Of Tomorrow" was being mapped out... I seem to remember Adam being on a big Beach Boys kick at the time, and very often a bootleg of "Smile" was played on Cave In trips. Scene Point Blank: There seems to be a whole lot going on during this record. I recently heard you have Santos of Old Man Gloom/Forensics playing drums for the tour. Any plans on having other musicians sit in with you as well? Mike: That very well may happen. These songs will be interpreted in many different ways over the next few tours. I want in no way to define these songs or lock them to any particular version. Words by Shane on Oct. 16, 2010, 11:05 a.m.
Posted by Shane on Oct. 16, 2010, 11:05 a.m.
Posted Feb. 23, 2019, 12:03 p.m.
Posted Dec. 10, 2009, 1:24 a.m.
Posted Feb. 20, 2008, 12:58 p.m.